If you see fungus, it’s too late to treat it. If you want to have a healthy garden, you have to take a long-term and proactive approach to pest management. This includes understanding the culture of your landscape – “how actions impact balances and relationships.” There is so much happening beneath and around our plants that we need to be aware of. Too often we focus too intently on the plants themselves. Attention to drainage, air flow, and crop rotation are examples of areas for pro-action. 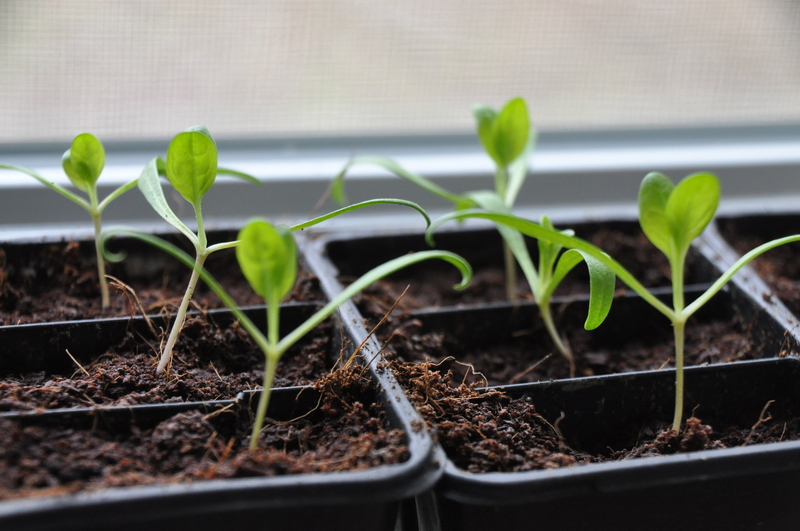 Banish old tomato plants from your kindgom. Scientists’ work develops from observation-based questions. Come this spring I’ll be “scouting” for problems in the garden everyday, then exploring options for addressing them. For example, if I see insect “frass” (aka bug poop), I’ll follow the trail and see where it leads and take action based on what I see. I’ll record the “ground truth” for weather related patterns as they arrive at our property like “growing degree days” as they pass. Be the hostess with the most-ess. Invite pollinators into your “insectary” and show them a good time. Find ways to provide a successive feast with at least three pollen sources spring, summer, and fall to keep them around your property rather than flying off to the next way station. That’s gonna take some research and planning. We’ll start by rearranging some of our perennials in groups and by incorporating flower beds throughout and around the the farm. This will help us create” corridors of connectivity,” or highways, for bees and butterflies to follow through your space so they don’t have to cross scary pathways where predators might gobble them up. The more you grow, the more you need to know. As urban farmers growing a variety of things in small spaces, we are both at an advantage and disadvantage over the large-scale, one product grower. We’ll need to learn the ideal growing conditions for a wide variety of plants. At least we won’t ever get bored. 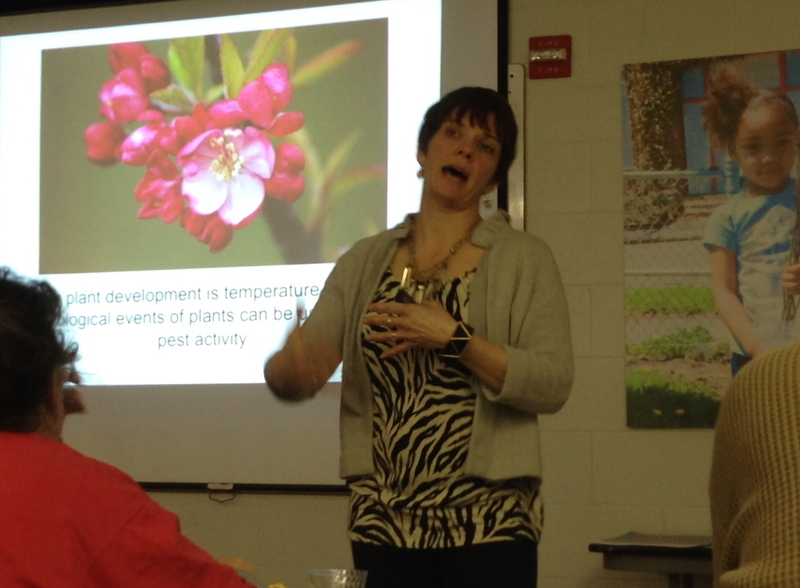 Categories: Uncategorized | Tags: Attracting Pollinators, Avoiding Plant Fungus, Bees, Denise Ellsworth OSU Extension, Garden Culture, Insectary, OSU Master Urban Farmer Series, Pests, Pollinators, Soil Health, The Ohio State University, Urban Farm Pollinators, Urban Farming | Permalink. It’s bitterly cold here in Central Ohio, again. But, I’m convinced this is the last of it. Snow and ice in the forecast this weekend, then I’m hoping we can keep temperatures in the 20s and 30s with some sunshine through March. I can handle that. I’m over this polar vortex business. Yesterday, Dan was off from work so we could attend Rosa’s 6th grade lip sync – a welcome respite from the winter blahs. 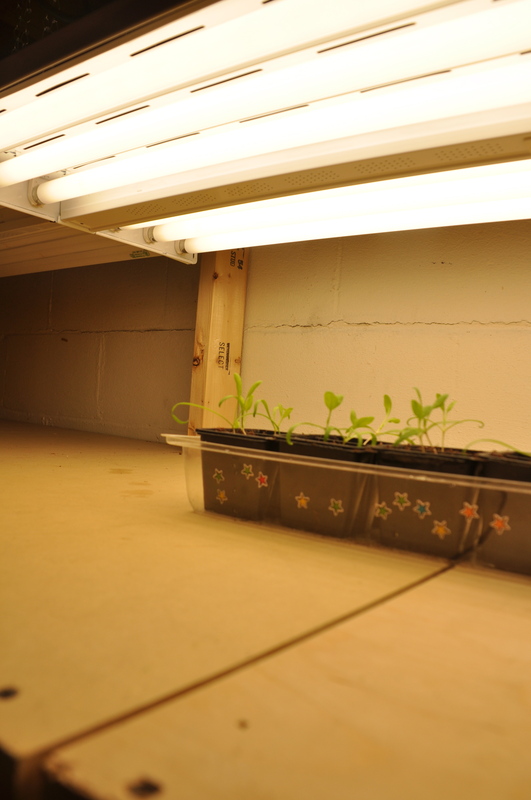 After that, we chilled out a bit and got our grow lights hung. We set them up on a few storage shelves I cleared off in the basement. They are out of the way and I figure if we do this every year, we’ll be forced to go through the junk that accumulates down there all year long. Two points! The lights are so bright I’m thinking of moving my office down there. Not really, but they are lovely – never thought I would say such a thing about fluorescent light fixtures. Dan’s one of those guys who always “knows a guy” to help us out with great prices and services and these high efficiency fixtures were no exception. They are pricey and I’m not sure we would have made the investment at retail price. While I’m super excited to be growing stuff in February, I’m wondering how much money we’ll save in the end, if any, by starting our own seeds. I suppose I should count up how many plants we end up growing and compare our costs with retail prices. Report on that sometime in May. 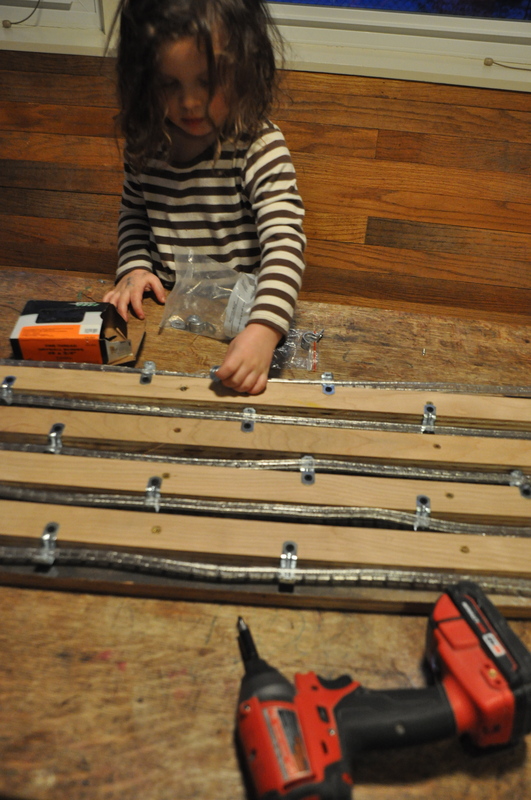 Categories: Uncategorized | Tags: Grow Lights, Seedlings, Sunshine in winter | Permalink. We are pleased to announce that our CSA subscriptions are committed for the 2014 season! We are humbled by the outpouring of support we have received from family, friends, and neighbors for this project and look forward to working for, and with, you all in the coming months. Our hope is that over time our members will outgrow their need for us, as they learn skills to use in their own edible backyards, making room for new members. So if you missed your chance to be part of the action this year, have no fear, there will be others! Also, as the season progresses, we’ll post surplus produce available for purchase on our Facebook page. If you haven’t “liked” us there yet, wait are you waiting for? Categories: Uncategorized | Tags: 2014 Season, Community Supported Agriculture, CSA | Permalink. 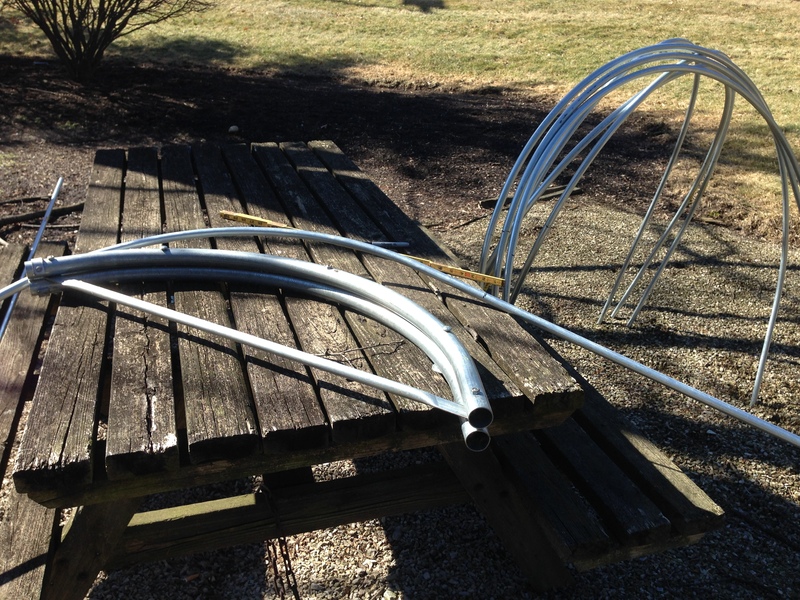 One of the things we’re most excited about experimenting with this spring and fall are tunnels – high and low. Tunnels are used to extend the growing and harvesting seasons. A tunnel over a garden bed creates a microclimate which magically transports the soil and air 500 miles south. So, in the spring, we can use low tunnels to get a jump on the growing season, and in the fall, we can use them to protect crops from the frost. The tunnels will behave similarly to our coldframe. Last week, Jesse Hickman of Local Matters – Columbus’s leading non-profit dedicated to “transforming the food system” and a co-sponsor of farm school – offered to lend me a low hoop bender the organization owns. I jumped at the opportunity and made use a few recent sunny days with temperatures over 30 degrees to give it a spin. I stabilized the bender on picnic table in a green space behind a bank and a funeral home at the end of our block and set to work. Dogs from adjacent lots were barking at me and I was waiting for the bank security to come ask me what I was building. All part of the urban farming experience, I suppose. 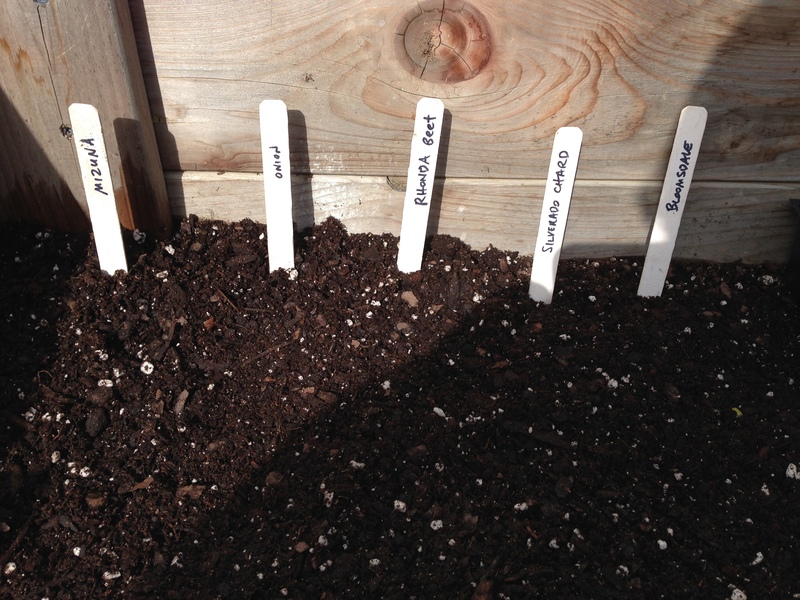 Categories: Uncategorized | Tags: Cold Weather Crops, Eliot Coleman, Germination Sensation, Low tunnels, Season Extension, Seedlings, Urban Farming | Permalink. This past fall we were on a tour at Swainway Urban Farm when our pal Milan, from Peace, Love, and Freedom Farm, asked Joseph Swain who inspires him. It was a great question and without hesitation, Joseph cited Eliot Coleman, the guru of Four Season Farming. I was somewhat familiar with Coleman’s work from articles he published in Mother Earth News, but we promptly checked a few of his books out from the library and haven’t looked back. With the coldframe already cleared of old growth and the soil smooth, we laid a 2-3 inch blanket (about 1 yard) of Happy Frog Potting Soil over all but the small section where we transplanted some seedlings earlier in the week. We set the seeds down in well marked rows and gave them a drink. And now, we wait. It used to be if I heard the term “seedbed,” my thoughts turned to performance artist Vito Acconci’s (1972) work of that title. If you don’t know it, look it up. (Just be warned, this work is not appropriate for all readers.) I won’t go into it here except to say, that I have new understanding of the term. These seeds are warm and cozy and we’re going to do all we can to keep them that way. Categories: Uncategorized | Tags: and Freedom Farm, Cold Weather Crops, Coldest Winter on Record, Coldframe, Columbus Ohio, Eliot Coleman, Four Season Farm, Germination Sensation, Joseph Swain, Love, Mother Earth News, Peace, Seedbed, Spinach, Sprouting Seeds, Swainway Urban Farm, Vito Acconci | Permalink. You can’t go anywhere this time of year in Central Ohio without hearing folks begging for the end of winter. Yesterday the temperature reached above forty degrees – for the first time in a very long time – and the sun shone brightly so Cora and I suited up and ventured outside to move our bodies and get some fresh air. 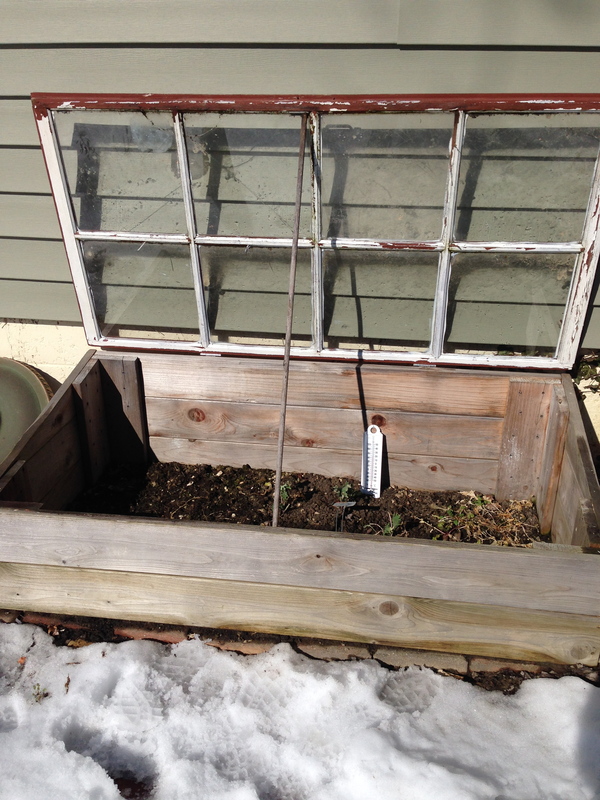 The melting snow was calling her, the coldframe was calling me. As I lifted the lid, the smell of fresh soil rose up with it. There was not much alive in there, a few kale plants that made it through the polar vortex were stretching up towards the light, taller than I had seen them in awhile. Some arugula was showing signs of rejuvenation but were mostly brown and wilted. We pulled all these old suckers out to make way for some new seedlings. (I briefly thought about leaving the the kale, but flashbacks of the cabbage worms that were feasting on them in the fall quickly changed my mind. 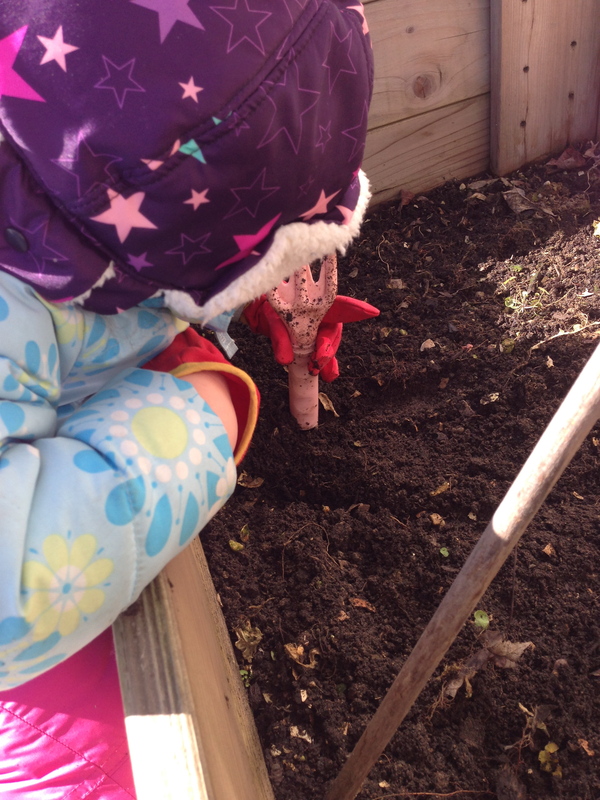 It was so nice to have our hands in the soil again. And the soil was warm! Dan built our coldframe in the Summer of 2012. We used it that fall to provide shelter for some greens. Last spring, I started a bunch of arugula, kale, and spinach in the box, some of which I moved out to the garden when the weather got warmer. These were my first experiments with season extension. I had read a few articles about such practices in Mother Earth News, but mostly I was just testing things out and seeing what worked for me. This year is a bit different. I’ve been doing lots of reading and have greater expectations for the frame as a result. Now that I know what it’s capable of, I’m ready to put this thing to work. The sun was out again today. I took a few of the spinach and kale seedlings I started inside and put them in a few inches of potting mix laid on top of the soil in the frame. I also left a few plants in the frame in the plastic cells I started them in. I closed the lid and went to farm school. The topic of the evening was, appropriately, season extension. At some point the instructor was speaking about hardening off seedlings before putting them out in the spring to acclimate them to heat and sun and I thought, oh no! 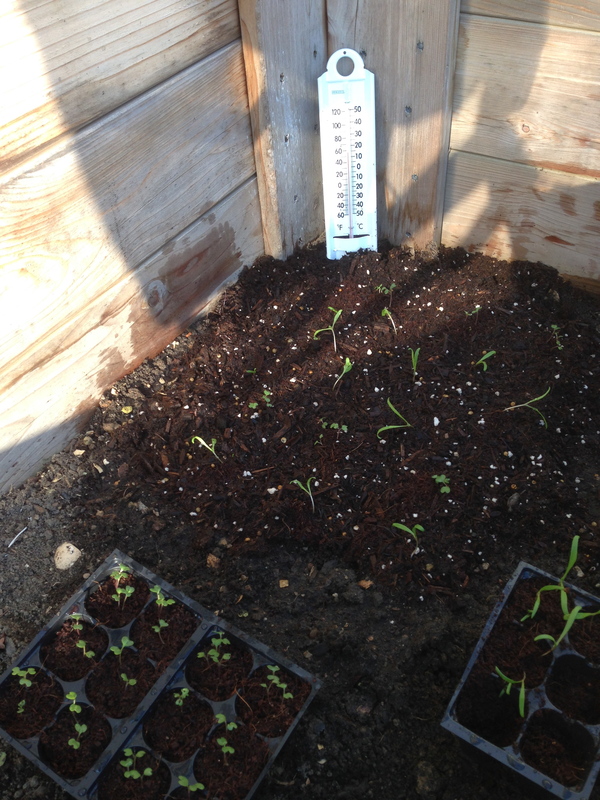 The seedlings I moved outside probably needed something similar to prevent them from getting shocked by the cold. So, when I got home, I grabbed the first thing I saw, a bright orange plastic sled, and placed it over the little guys hoping it would act as a kind of low tunnel, adding an additional layer of protection. Categories: Uncategorized | Tags: Cold Weather Crops, Coldest Winter on Record, Coldframe, Germination Sensation, Master Urban Farmer Workshop, Mother Earth News, Season Extension, Seedlings, Strega Nona's Harvest, The Ohio State University | Permalink. A few years back, Dan bought me a compost bin for my birthday. It was a bit unconventional as far as gifts go, and I went totally gaga over it. Neither one of us is too particular about holiday gifts and years go by when one or the other of us misses a birthday or anniversary. Valentine’s Day doesn’t even make it on the radar. But we did work on something together this past week for the farm that seems worth mentioning in honor of this day dedicated to spreading the warmth of love; a heating mat for seed germination. 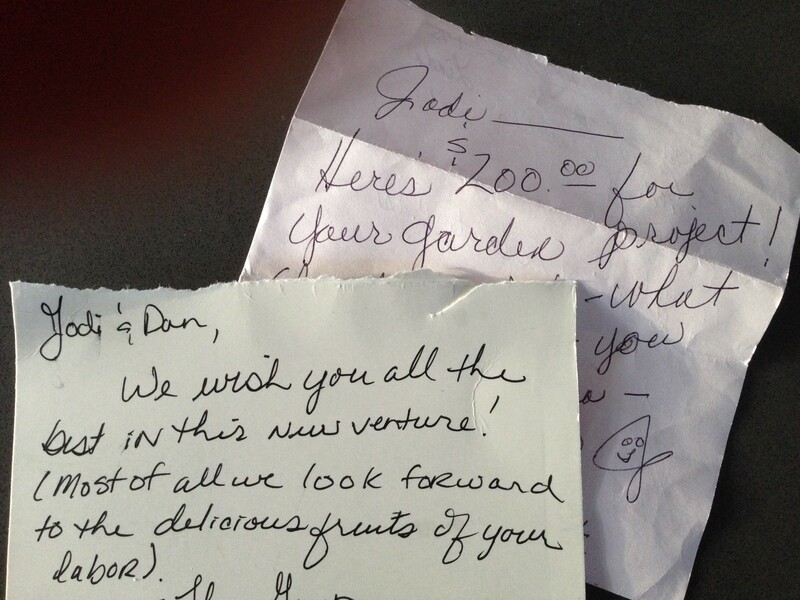 We borrowed the plans from The Vegetable Gardener. Dan did the carpentry, Cora and I ran the drill. The mat will help us raise the temperature of our coco as we start seeds for heat-loving plants like tomatoes and peppers. We’ll be testing it out this weekend on some marigold seeds. Stay tuned. Categories: Uncategorized | Tags: Compost Bin, DIY Seed warming mat, Germination Sensation, Gifts, Season Extension, The Vegetable Gardener, Valentine's Day | Permalink. Find a book to delight a child. Bumbling around, just trying to figure out how to feed ourselves.